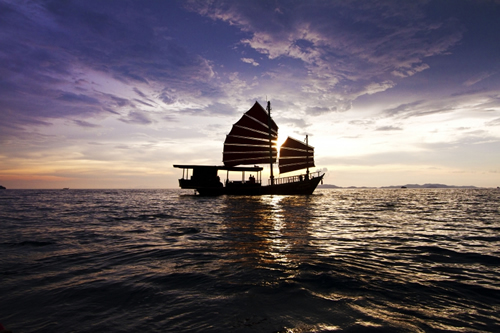 Take a journey back in time aboard the Pla Luang, one of the last remaining Siamese sailing junks. Cruise with us and relax on her polished teak decks beneath her distinctive red sails. 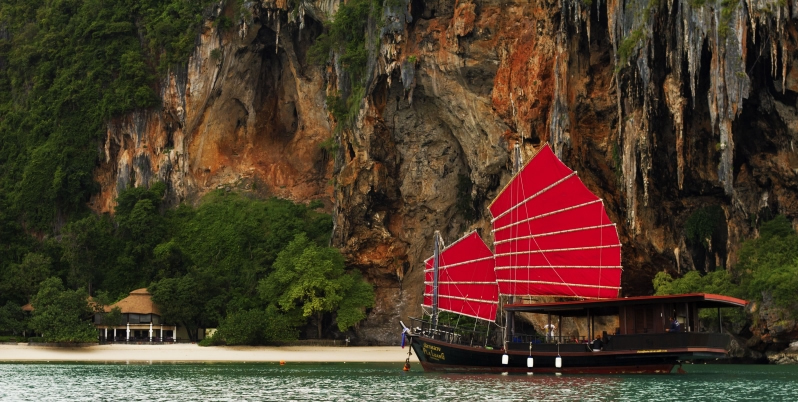 Sailing daily from Railay Beach Krabi this is a truly unique cruise not to be missed. Pla Luang translates to "the honorable fish" and is a noble and respected name in Thailand. Pla Luang was originally a trade vessel over 100 years ago. She traveled extensively transporting goods all over South East Asia. She now resides in Railay where she has been lovenly restored. 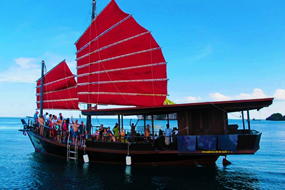 The sunset cruise runs 7 days a week and commences at 1:30pm till 8pm from Railay Beach. We make our way out to the surrounding islands to snorkel, cliff jump, sunbathe and relax on board with a cocktail in hand. After which a Thai style dinner is served as we slowly sail back towards Railay as the sun is setting over the Andaman sea. We also make a night stop to swim in the bioluminescence- something not to be missed! 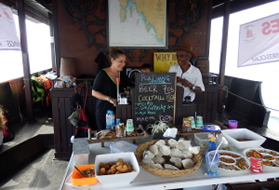 We have a bar on board where you can purchase beer, cocktails and imported wine. Pla Luang can also be hired privately for full day trips, weddings, parties, and special events of up to 36 people. Once we have received your booking we will email you confirmation of the availability of your dates. The email will contain a link to our secure credit card payment gateway from which you have the choice of paying a deposit on your booking with either a VISA or a Master Card. Our secure credit card gateway is implemented with 128 bit encryption in conjunction with the Bank of Asia. You must give at least 1 weeks notice to cancel your booking. If you do cancel, there is a cancellation fee of 10% of the total cost (that's what VISA charges us).. If you cancel with less then a weeks notice we may be unable to refund your payment. If you need to reschedule your booking, please let us know as soon as possible and depending on availability we will do our best to accommodate you. In addition we are now providing refunds for natural disasters. If a natural disaster occurs and your cancellation notice has expired, we will provide a refund of 75% of the booking, or reschedule your booking (depending on customer preference). Natural disasters are limited to Tsunamis, earthquakes, volcanoes, comet strikes and the end of the world.